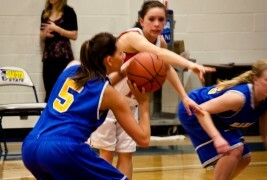 Dakota State’s women’s team looked to snap their six-game losing streak against Minot State in Madison Saturday. The Trojans outside shooting and bench helped lift their record to 6-16 overall and 2-8 in the conference. The Trojans came out with a great start and carried through the game to grab the win. At the start of regulation, the Trojans put on an amazing shooting performance, while the beavers struggled from the field. The Trojans shot 8 for 10 from the field and a perfect 5 for 5 for the arc. Right before the half the Beavers climb back into this one cutting the lead to 34-28 going into halftime. In the second half both teams battled back and forth for the lead. Towards the end of the second half the beavers scored 4 straight points to take the lead of 67-63. But once again the Lady T’s grabbed the lead again with the sharp shooting of Julie Munson. After the three from Munson, the Trojans put away the beavers with some clutch free-throws from LaTasha Dowell. The Trojans walked away with the win with a score of 72-67. The difference in this game was the big time performance by the Lady T’s bench players. Julie Munson had 14 points and April Mielke had 11 off the bench. DSU’s bench outscored the Beavers 37 to 9. Aneshia Starks was all over the court doing everything. She had eight points, six boards, 4 assists and three steals. The lady Trojans will look to keep their shooting percentage up next weekend as they travel out to west river to take on Black Hills State. The Men’s team extended their winning streak to five games in a row. The Trojans had some great individual performances and some scrappy team defense to take this one in convincing victory. The Trojans won this game by a score of 65 to 50. This win moved the Trojans up to 14-10 overall and 5-5 in the conference. In the start of this game Minot took and early 8-2 lead. However, the Trojans came right back with a 16-9 run to take their first lead of the game with a score of 18 to 17. Both teams continued to battle back and forth, but the Beavers took a small lead going into halftime with a score of 34-32. In the second half of the game , both teams went on scoring runs to give them the lead. DSU came out with 11 straight points to take the lead, but then the beavers answered right back with and 11-2 scoring run of their own to tie the game up at 45. For the rest of the game the Trojans outscored Minot 20 to 5. The Trojans defense came out with a lockdown performance holding Minot to 16 points in the second half. “Our hands have been a lot more active on defense, also when Bryce (Snyder) has a big game it really helps us out because he is the core of our defense,” stated Coach Garner. Bryce Snyder had a double-double with 18 points and 15 rebounds. Also the brother of Bryce, Jordan Snyder had 6 points and 8 rebounds. The Snyder brothers had 23 of the 42 rebounds for Dakota State. Mike Larsen also added 15 points and Santino Clay had 13 points and 4 steals. The Men’s team will also travel out west next weekend to play Black Hills Friday and SD Tech on Saturday. The B.I.G. Job Fair is Fast Approaching!